The Academy at Nola Dunn is a K–5 elementary school in Texas’ Burleson Independent School District (ISD). Completed in 2010, the 9940-m2 (107,000-sf) building has an external envelope consisting of insulated concrete form (ICF) walls and integrated framing assembly (IFA) door and window frames. Fenestration products come in a wide variety of forms, ranging from window units manufactured in a production facility to custom ‘stick-built’ curtain wall products that are assembled in the field. At some point, windows reach the end of their useful life. The question is, how does a building owner know whether it is advisable to defer a window project another year or two, or to call in a design professional right away? Sound isolation between rooms can be important for speech privacy. For example, in patient exam rooms in a medical building, conversations between patients and their doctors are meant to be confidential. Parking garages are an integral part of our nation’s infrastructure. Although they are subject to more deterioration than other building types, their maintenance is typically not considered of primary importance to building owners or managers. The Scarlet Pearl Casino Resort not only raised the bar for casino design in the Biloxi, Mississippi region, but also successfully addressed rigid Federal Emergency Management Agency (FEMA) regulations while utilizing innovative technology to meet a fast-paced construction schedule. Two nearly identical domes constructed in different climate zones provide an opportunity to evaluate the ways in which environment and weather affect service life and performance of construction materials. One of the domes is located in the Southeast, in a hot, humid climate, and the other is located in the northern Plains region, in a cold, arid climate. Both domes were the subject of detailed condition assessments for development of maintenance-type repairs. The gold-colored anodized finish on the dome located in the Plains is intact. The visually distinctive geodesic domes were constructed in the mid-1970s and early 1980s as roof/enclosure systems for athletic facilities on college campuses. Each dome forms a clear span across the entire interior, providing an open court for sporting events. The hexagonal structural framework of the domes is expressed on the exterior of the building with exposed tubular aluminum struts spanning between connector nodes. In both cases, the dome shell consists of anodized aluminum plates, shaped to fit the complex geometry of the shell. 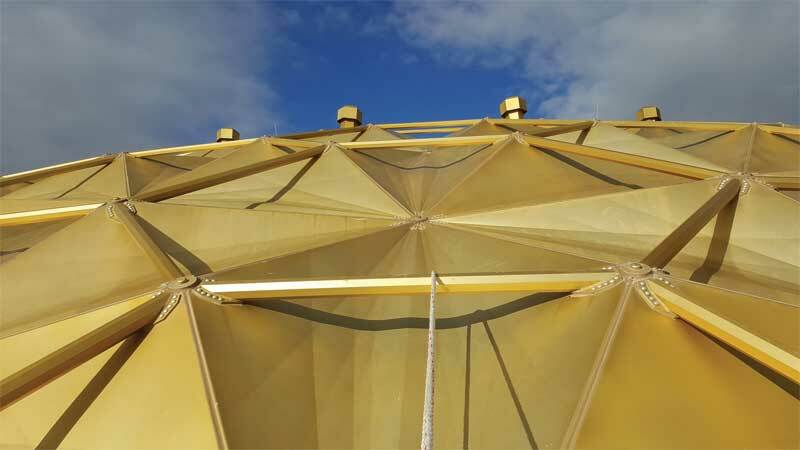 The dome structure and cladding panels were fabricated with a gold-colored anodized finish. After approximately 30 years in service, the difference in appearance between the domes is striking. On the dome located in the northern Plains the finish is for the most part intact, while on the dome located in the Southeast, only remnants of the original finish remain. On the dome located in the southeast, only remnants of the anodized finish remain. The panels and struts on both domes were manufactured by the same company, and the fabrication and anodizing process are believed to be similar; neither dome had been recoated. Past maintenance efforts relative to the finish—which could have had a significant impact on the condition and appearance of the anodized finish—are reported to have been minimal. The primary known difference in the service life history of the two domes is the environment in which the buildings were constructed. You May Also Like What were they thinking? 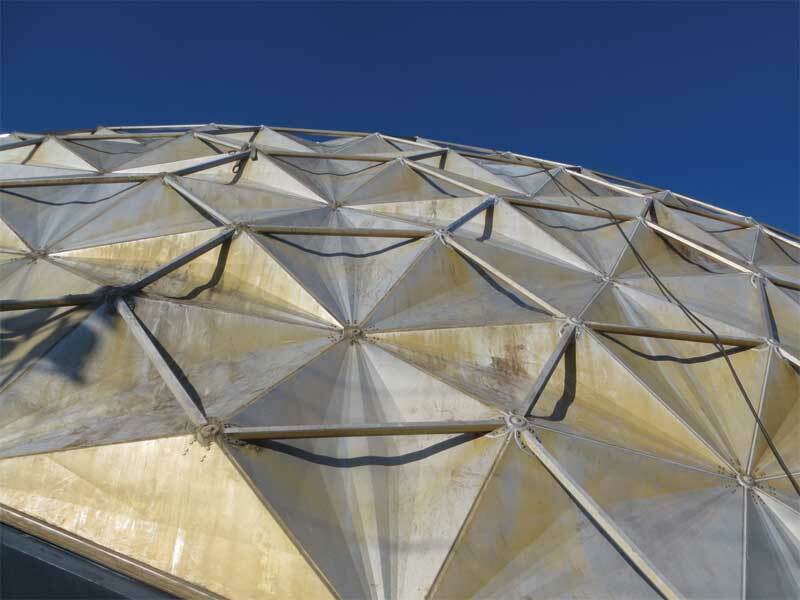 Although anodized finishes on aluminum generally provide good serviceability, factors affecting the finish on the southern dome include exposure to a marine environment and to acids in the atmosphere. Although located some distance from the coast, the southern dome was vulnerable to salt deposition during severe weather, which may have accelerated the deterioration of the finish. However, a more significant contributor is likely the presence of acids, in the form of cleaning chemicals, precipitation, or a combination thereof. A detailed history of prior maintenance was not available to confirm the southern dome was not previously cleaned using aggressive methods that might have damaged or partially removed the finish. Also, while rainfall in the Southeast has lower acidity than in the Ohio Valley and the Northeast where industrial activities are more intensive, it is still significantly more acidic than in the country’s West. One lesson learned from this comparison is the importance of understanding the environment when selecting finishes. Sun, wind, rain, and snow—and the acid content of the precipitation—can have a dramatic effect on the serviceability, required maintenance, and service life of finishes. These factors should be taken into account in the design and specification of these systems, and fully understood by building owners. The opinions expressed in Failures are based on the authors’ experiences and do not necessarily reflect those of The Construction Specifier or CSI. Deborah Slaton is an architectural conservator and principal with Wiss, Janney, Elstner Associates (WJE) in Northbrook, Illinois, specializing in historic preservation and materials conservation. She can be reached at dslaton@wje.com. in Princeton, New Jersey. He specializes in investigation and repair of the building envelope. He can be reached at dpatterson@wje.com.